I was looking for a quick dessert for our dinner on Sunday. 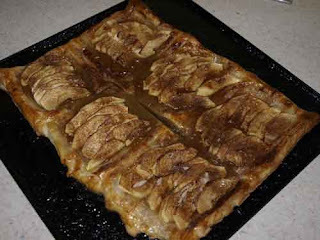 I had some puff pastry in the freezer and some apples in the fruit bowl, so a quick search on the web found me this recipe for Minute Apple Tart. It was very easy and absolutely delicious served with vanilla ice-cream! Now that is looking good! Thanks for the link! Now this is my kind of dessert! Quick, easy and delicious! Yum! That looks delicious Janice and very easy to do! Looks a winner to me! 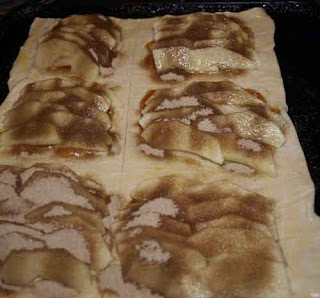 What could be nicer than puff pastry with apples. I really love the ease with which this can be prepared. This looks delicious. I would love that for dessert later. Looks delicious. Would love to try. Mmm apples and pastry, what could be more tastier! Quick and easy makes it a very appealable too! Thank you for your visit to my Magpie's Nest and for your lovely comment! Your blog is delicious and inspiring and I am now officially VERY hungry for a bite of lunch! Thank you for sharing! This really is my kind of dessert. I have become addicted to anything apple...I'm ashamed to say it...but even those little pies from McDonald's.